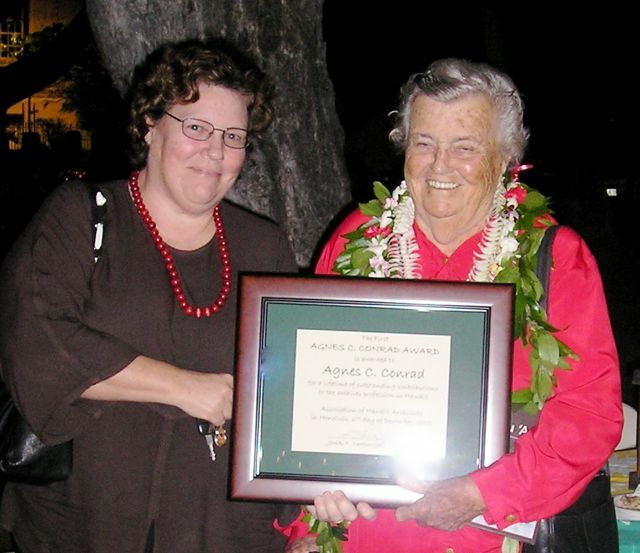 The Association of Hawaii Archivists established the Agnes C. Conrad Award to recognize outstanding contributions to the archives profession in Hawai’i. On December 6, 2005 the first Award was given to Agnes C. Conrad. She was appointed Territorial Archivist in 1955 and was the State Archivist from 1959 until she retired in 1982. Ms. Conrad essentially created the archives profession in Hawai‘i, instituting professional standards for archives and records management and facilitating the creation and construction of the state records center. She was a mentor to other professional archivists and became a treasured resource for historians of the state. She wrote, edited, and collaborated in the publication of many books and articles about Hawai‘i. Among them are Proceedings of the Constitutional Convention of Hawai‘i, 1950; The Written Record of Hawai‘i’s Women: An Annotated Guide to Sources of Information in Hawaii; the Index to the Hawaiian Journal of History, volumes 1-35; and Guides to Hawaiian Registered Vessels: Including Finding Aids for Registers of Transfer, 1864-1900. Ms. Conrad actively participated in and supported many professional groups: the Judicial History Center, Friends of Iolani Palace; the Hawaiian Historical Society; the Hawaii Musuems Association; the Society of American Archivists, of which she was made a Fellow in 1964; and the Association of Hawaii Archivists.